Friday News Roundup: Volunteering on the Clock, Warren Buffet Investment Advice and More. Our weekly Friday news roundup pulls some of the most interesting HR-related news pieces of the week from around the internet. This week we discuss monitoring employees by GPS, the proposed merger of US Airways and American Airlines, and more. 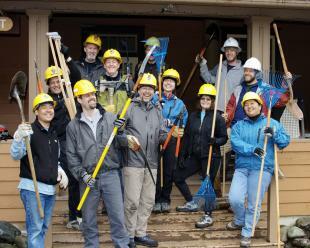 More and more companies are offering opportunities for paid time off spent volunteering. The Society for Human Resource Management calculates that about 20% of US employers offered a set amount of paid time off specifically for volunteering this year. With busy work, family, and personal schedules, many employees appreciate the opportunity to vary the work day and actively participate in pro bono volunteer work in their community. In addition, volunteering is a great way for employees to bond with coworkers, feel connected to the company, and stay engaged. Have you considered PTO volunteer time in your company? Amazon founder Jeff Bezos’ purchase of the Washington Post last week came with an added bonus; The Post’s pension plan has $1 billion more than it needs. In a time when many companies’ pension plans are struggling, The Post thrives in large part thanks to a little 1975 piece of investment advice from Warren Buffet to then CEO Katharine Graham. Buffet’s advice: think like an owner, look for a discount, and be patient. While few of us will attain Buffet’s signature investment eye for the future, it serves as a good reminder that evaluating, structuring, and negotiating your pension plan now can pay off huge rewards in the future. Using GPS to Investigate Employees? A New York Appeals court ruled this week that an investigation of a state employee’s unauthorized absences involving a GPS tracking device on the employee’s car was in fact “unreasonable.” The GPS, which was attached to the employee’s car without his knowledge, recorded all of the car’s movements 24/7 for a month. The court found the evidence gathered from the GPS surveillance to be unreasonable and thus not viable for use in the investigation because the employer made no effort to stop monitoring the employee when he was off the clock. This Monday, the Department of Justice temporarily blocked the proposed merger of American Airlines and US Airways which would form the world’s largest airline. While the merger raises many questions as to what this will mean for travelers, it will surely result in a major HR upheaval for both companies as they join forces and cultures under the American brand name. In fact, a recent study shows the HR department holds more leadership influence in driving company culture than even the executive suite. What are some things you do to define/maintain your company culture? What factors contribute to transforming the culture of a company?